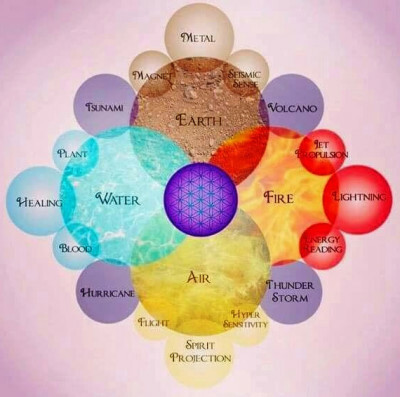 air, water, earth, fire, space; each with its unique association to certain colors, materials and symbolism. For eg, the colour of the fire element is red, while that of wood are green and aqua-related colors. 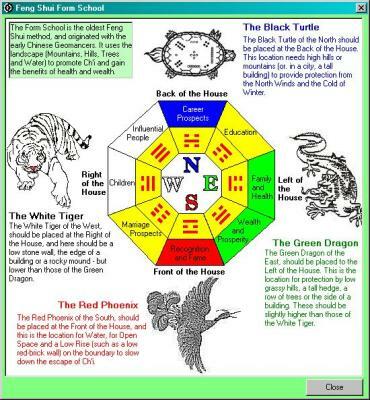 Fengshui (literally “wind-water”) is a form of geomantic divination based on the workings of the cosmological concepts yinyang and qi. The technique of FengShui is said to be over 3,500 years old. factory layout, you will realise that your home/ office..
changes can bring in a shift in the Chi/Qi. does for time, seeking the most auspicious arrangements of the material environment." Objects that allow qi to flow freely are said to have good feng shui, which is said to bring prosperity and success. In the old days only the Chinese emperor was allowed to use it. Beyond Feng Shui is an extraordinary combination of science, universal laws, intuition, common sense, design, and ecology, which can be used by everyone beneficially and effectively. Beyond Feng-Shui Analysis, begins by evaluating what is going on in various areas of one’s life; which areas of life are flowing smoothly, which need strengthening, & which aspects need a complete make-over. Beyond Feng Shui has been a workshop very close to my life. It has shadowed every area of my life and has contributed greatly to the growth of my family and me. I first attended the Feng Shui workshop with my then fiancé in Sept 2001 and within a year of attending the workshop we bought our new house. A house chosen by us as we loved and its layout was very appealing as per Feng Shui. That house brought us personal growth, professional growth, abundance, children and many smaller joys of life and another larger house. In 2010, I participated in the Beyond Feng Shui workshop soon after we bought the new house. Feng Shui is the study of the energy of a house. The house is a reflection of the people staying in it. Whenever I have found myself stuck in an area of my life I found that area as reflected in the house indicating it too. One such instance is when we moved to our new house we took every effort to make the house very easy and convenient. Then too I found myself always drained of energy and always up in activity and tired. A few months down the line we discovered that there a seepage in that part of the house which reflects the female energy. The other instance is whenever I have cleaned up the abundance area of the house I have received money within 24hours. Last week I realized we were getting upset with our son every now and then and he was always being reprimanded till in the next few days I saw his cupboard was completely messy and holding lot of unwanted things. I immediately cleared it up and that energy getting cleared up showed in my son’s life. Feng Shui is not about putting things in the house to impact our life though that is definitely a part of it. Feng Shui is to understand the energy and feeling the energy of the house, clearing clutter and influencing the energy flow in the house to impact for the better. I am a strong believer of the view that every change has to come from within to the outside but in Feng Shui I learnt the outside can be very supportive in highlighting that something needs to be changed within us which we may not be able to see otherwise. We always felt and believed our home was happy and positive. When we decided to do a Feng Shui Consultancy with Kryon Source, not only did we learn the different things in our home that had positive influences, we also learnt several things that came in the way of career, money, relationship, etc. A few weeks after the consultation we began to observe changes in the form of opportunities that showed us light at the end of the tunnel. It came in the form of a new job for my husband, money unexpectedly coming in, temperamental changes in us as people, obstacles vanishing. We are truly grateful to Kryon Source for making this shift in energy in our home that is now filled with love and happiness. Indeed Feng Shui has moved us closer to our dreams! Fire, Water, Metal, Wood & Earth are present in our homes in various forms. Once we learn to balance these elements in our home, office or other various surroundings, Nature starts to reward us with harmony, happiness & peace inside & outside. When I saw the movie AVATAR, I kept remembering FENG SHUI Workshop. The Navi people believed in respecting, loving, praying & listening to Nature, because of which they lived a simple & happy life & they were so blessed with precious gifts inside them & outside in their environment. Ancient civilisations also prayed to NATURE & its forces. I have learnt this balancing art for my home & my environment & the application is very very simple & easy. A few basic principles to be kept in mind & that's it. I did the workshop with my husband. The amount of cleansing & clutter clearing that happened between two of us, allowed us to take our relationship to a new level. We have a mature understanding & loving relationship today.There is crystal clarity & openeness regarding all things. I have foregone the need to hide things or supress things. Before doing this workshop MARRIAGE = RESPONSIBILITY and responsibility was like this 100kg rock on both my shoulders, which meant being stressed out 24 x 7. Thanks to Wisdom Centre, I could finally unburden myself.